This is a two page worksheet that has 4 monohybrid genetics problems. 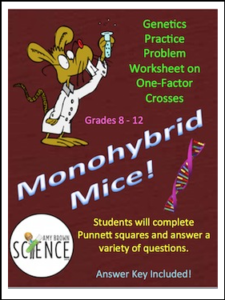 Each problem requires the student to fill in the Punnett square, fill in a table of genotypes and phenotypes and probabilities, and answer 7 to 8 questions about each problem. This can be used as an introductory worksheet, as a homework assignment, or as a short quiz on monohybrid crosses. Your download will include both a PDF file and a Word document.